LOL Duncan love super dog taking super nap. Have a marvellous Monday. You make a perfect Super Dog ! BOL....You are a very cute Super guy Duncan! Duncan I love your costume and mom loves your patio!! Duncan we all KNOW that even SUPER HEROES need a POWER nap now and then. You look super in your SUPER Clawstoom. Are you quite sure you're up to this Super Dog thing Duncan? Bwahaahaa! Now that we think about it, Superheros must sleep sometime! OMD! 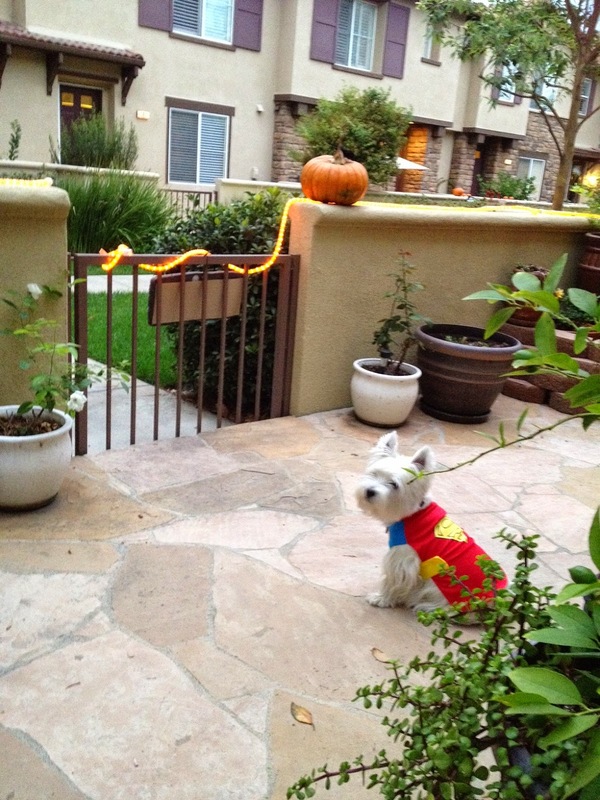 You look sooooo CUTE in your SuperDog Costume Duncan!!! Though, I thinks your friend there needs a little help! Maybe a margarita! I was thinkin' of makin' some pumpkin margaritas! I'll bring some overs...looks like you need a PAWTY! Ya make a cute Super Dog, but I are not sure he are sposed to be nappin on da job. Business was slow in MV, too. We couldn't figure it out! Your costume is perfect! Not many trick-er-treaters 'round here, either... but no nappin' on da job!! Ya is supposed to be on zombie alert!! Crikey .... it sure was slow at your house, aye?? We had over 200 kids call to our house. I had to spend the night in my crate course I was still crook and had to be kept quiet. I was so looking forward to halloween night too but I guess it was for the best. We could have used your super hero help at our house. Duncan,Thank you so much for stopping by for the election results today.